30 Days of Learning in Ontario: Gearing Up! 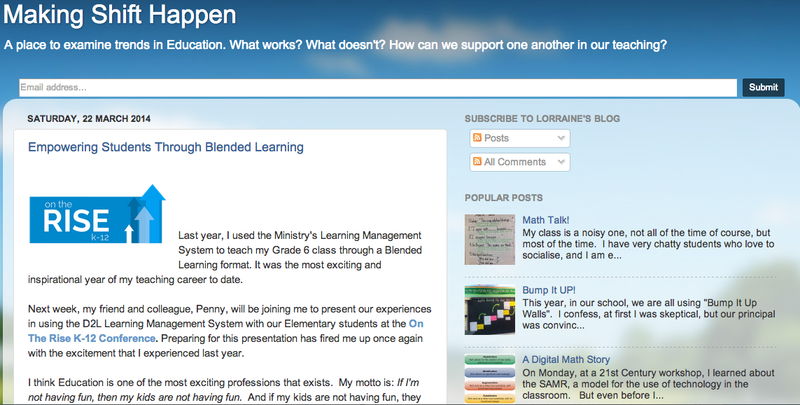 The blog posts are rolling in and we are anticipating an excellent month of collaborative blogging by Ontario educators! If you haven’t started writing yet (or recording, or drawing) there is no time like right now to start! What did you learn today? (or yesterday, or last week). This is an opportunity to model connected learning for all. As we considered how to roll out this project, we asked some established Ontario bloggers to contribute early. Rodd Lucier (@thecleversheep) is a creative force in Ontario Education, leading the use of technology, and sharing his understanding through writing and podcasting for so many of us to learn from. He is the force behind UnPlug*d (http://unplugd.ca/), an experience that changed the career and life trajectories of many educators around the world. Rodd has kindly shared his learning as a model to get us started. Please take a moment to listen to his blog post. Collaborative Blogging: What Did You Learn Today? 30 Days of Learning in Ontario: What Did You Learn Today? 30 Days of Learning is a collective/collaborative blog where each day, someone in the Ontario Education Community shares something they have learned. We know that personal reflection is a key ingredient for learning. By reflecting on, and sharing our learning, we are modelling the practice for others. We know that to drive innovative thinking forward, we must be willing to take risks. This collective blog provides a safe prompt and a community of support to help educators take advantage of an opportunity to begin openly sharing their learning. What did you learn today? Please respond in 500 words or less (aim for around 300). It can be in writing, audio, video, or a combination. Ask if you need help finding images suitable for publication (creative commons licensed, for example). Email you submission to ossemooc at gmail.com. Include your First and Last Name (mandatory), and a short bio, your blog address and your twitter handle if you like. Please submit asap, as the first 30 submissions will be published. The “official” launch of the project will occur at OTRK12. Thanks for your support, and we look forward to reading about your learning! 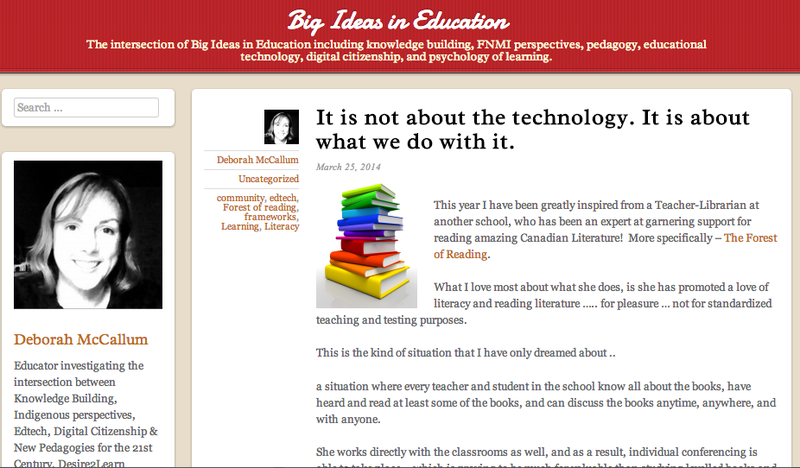 Here are a few new posts written by Ontario Educators over the past few days. Let’s support our bloggers who are making their thinking visible, reflecting on their learning and sharing with others. Continue the conversation by providing feedback in the comments. Join us at 8:00 p.m. (EDT) on March 25 to discuss the future of teaching and learning in Ontario (see content details below). Welcome to another week of sharing and connecting through #OSSEMOOC! This week our theme is The Future of Learning and Teaching. 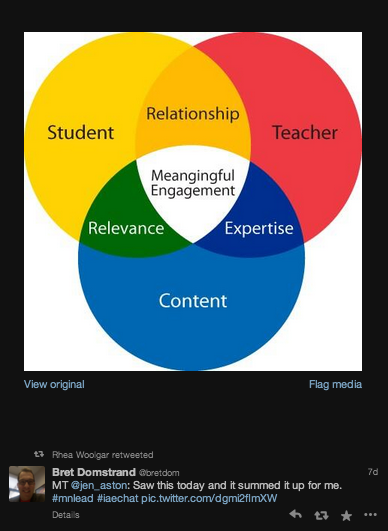 If we consider the Student Voice in this image created by MSAC in 2013, does our current practice align? What will teaching and learning look like five years from now? What tools will students need to learn and to demonstrate their learning in the future? We have two challenges for you this week. First, as you become a connected learner, set aside 15 minutes every day to connect to an educator outside of your school and board. For example, click on a link to a blog written by an Ontario School/System Leader and/or by one of the educators currently learning through OSSEMOOC. What are they learning? How are they sharing their learning? What do you think? Perhaps give them some feedback on their thinking through the comments. All bloggers love to hear from their readers! It’s so encouraging! Then, think about your own learning. What did you learn today? Can you share your learning in 500 words or less? Next week OSSEMOOC is starting a collective blog where educators can share their learning. Please think about your own learning today. What can you share with others? It is only through sharing and making our thinking visible that we can learn from each other. More information on how to submit your learning will follow. Monday, March 24: Be sure to check out the MSAC graphic (above), and think about how your own ideas for the future of learning align with those the students presented to the Minister of Education last year. As we have travelled throughout the province this week, we have heard loud and clear that we need an easier entry point for our education leaders to start the connecting process. Last Tuesday, connected leaders met to discuss how they became connected leaders – the catalyst that got them started. Here are some of the things we learned. Which of these do you need? Which of these can you bring to a leader you know to help them connect? 1. TIME! When can we possibly find the time to connect? Educators are busy. Nobody disputes that! But could connecting actually make your life easier? YES IT CAN! You can pose a question on Twitter 24/7 and get an answer in minutes. We have heard many stories with this theme. Learn to make time. Start with 15 minutes each day. Some of us do “Tea and Twitter”, some of us start our day with a cup of coffee and Twitter. Others put the children to bed and then have some quiet professional learning time on a social network. A commitment of 15 minutes each day seems reasonable if we know there will be a reward for investing that time. As we move forward, connecting as a learner and modelling that learning will become essential. We would argue that it already is. It’s not going away! 2. A REASON TO CONNECT. Why Bother? Many of us shared that we started connecting because we were faced with a professional situation where we needed help, and social media offered access to that personal professional learning we needed to be successful. Some needed help with implementing BYOD. Others found themselves in roles that were new to them, and they needed to connect to others with a similar role in the province. Clearly an urgent need for information drove many connected learners to the habit of connecting and learning from their peers and experts in the field through social media. But if our students are to be connected learners, we need connected teachers, and if we need connected teachers, our school and system leaders must model that connected learning. Fullan and Langworthy 2014, A Rich Seam, Page 34. 3. HOW DO I START? What Do I Do First? Once you have set aside your connecting time, plan what you will do with it. Perhaps lurking is a good start. Follow some educators on Twitter (email ossemooc at gmail.com if you need suggestions). Find a connected educator close to you and ask for help. Make a plan to move forward. Register to attend a conference about connected learning. Attend OSSEMOOC on Tuesday nights at 8 p.m. to find people you can talk to synchronously. Get a Pinterest Account. Search for education boards to follow. Be consistent. Put in the time. Get confident and familiar with the medium. Make it a priority in your professional learning. Once you decide it is important, and you set aside time to practice, let us know. We will help. There are pockets of excellence throughout the province. Learn from your peers. Learn from the experts. Find your own voice. If you are leading learning, you need to model how learning happens in 2014. The time to learn is now, and the OSSEMOOC team will support you in your learning. Here is one of our favourite places for encouragement and support to become a connected leader. Check it out! March Break is over! It’s time to take your next steps to becoming a connected leader! Over the next few weeks, OSSEMOOC will be throwing out some simple challenges and habits to form to help move Ontario leaders forward in their goal to get connected. What are those next steps? What are some of the early habits that lead to being a connected leader? Join us tonight at 8:00 to explore this topic. Are you a connected educator? Join us and share your story of getting connected. Are you new to the idea and habit of learning from an extensive Professional Learning Network? Drop in and consider your own personal next steps. Continue to follow us @OSSEMOOC on Twitter (#OSSEMOOC) as we share opportunities to connect and learn. 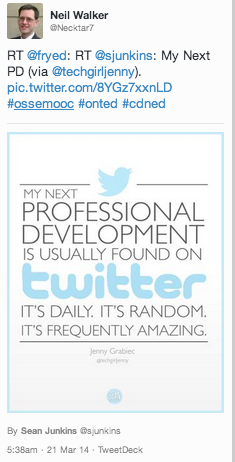 There are literally hundreds of Twitter chats for educators. Recently, we have heard that there are many educators who love to lurk on Twitter chats to learn from the conversations. Whether you participate in the conversation, or you just want to sit back and learn at this point in your personal growth, here are some of the MANY twitter chats that are worth your time. #OSSEMOOC from China! Share your voice – because you can. #OSSEMOOC comes to you from China this week as Mark Carbone experiences life from a different perspective, and shares with us his thoughts on blogging as educators in Canada. Let’s share, because we can.